NVIDIA’s GeForce GTX 750 might have introduced the world to Maxwell, but in reality, that chip should have been called “Maxwell Light”. Since that release, NVIDIA’s piled on more features and capabilities, most of which are far beyond what you’d want to be running on a lower-end part. The most interesting features of Maxwell include DSR, an interesting resolution scaler; MFAA, a low-cost anti-aliasing setting; VR Direct, enhancements beneficial to peripherals like the Oculus Rift; VXGI, a truly comprehensive voxel-based lighting technology; as well as memory compression. Let’s start with the latter, memory compression. 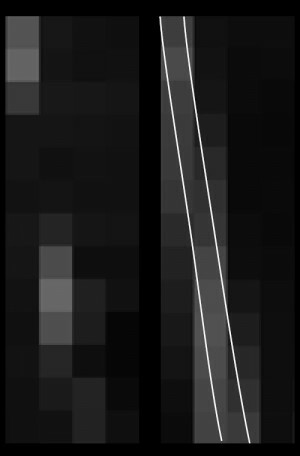 Like any other type of data compression, the goal here is to store the same amount of information in a smaller footprint, something easily done when a patch (in this case, 8×8 pixels) contains a lot of the same color. To the left in the example below, 8 identical colors are stored in order within this grid of 64 pixels. The box directly next to this shows that this information can be perfectly compressed with an 8:1 ratio, which dramatically reduces the memory footprint. In some cases, you may only be able go 4:1 or 2:1, but any gain is still a gain. In the event that a grid can’t be compressed, it’s simply left alone. It’d be easy to believe that many games wouldn’t benefit from memory compression, especially those that have extremely varied scenes – but you might be surprised. Below is a screenshot from one of the GRID games, and here, all of the purple represents blocks that were able to be compressed. Of course, not all of these blocks would have been compressed to the same degree; some might be 8:1, while others could be 2:1. Because of memory compression’s success here, VRAM usage is far less on Maxwell than it would be on Kepler – something I find a little humorous since Maxwell gives us more VRAM to deal with. 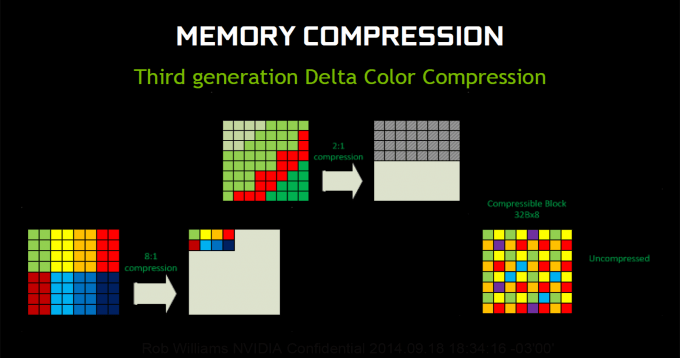 On average, NVIDIA expects that VRAM usage will decrease between 17% and 29% on average. Further, assuming that an average of 25% could be compressed, that’d “effectively” increase the VRAM speed from 7Gbps to 9.3Gbps – a potential boon to higher-end resolutions (such as 4K). The most complex technology discussed during the Maxwell briefing is VXGI, or Voxel Global Illumination. GI in itself isn’t new, and neither is VXGI for that matter, but on Maxwell, the tuned architecture allows it to run far more effectively. Its goal is to increase the realism of global illumination, making scenes much more believable, thanks to very in-depth sampling led by voxelization (turning objects into a series of blocks) of a scene. In terms of hyper-realistic lighting, no technology could compete with ray tracing, but VXGI’s goal is to offer as close to ray tracing’s realism as possible without requiring an enormous amount of GPU horsepower. 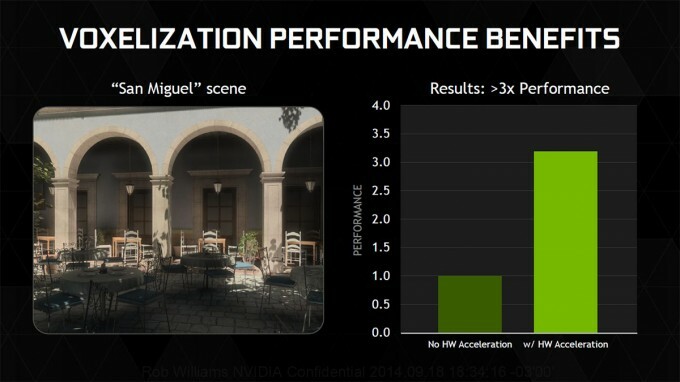 From previous GPU-related events, I’ve seen immensely ray traced scenes that have run at about 1 FPS while backed by multiple high-end GPUs, and that right there is why VXGI is a far more likely technology to be implemented into our games. It goes without saying that VXGI’s realistic lighting will come at a higher cost than other global illumination methods, but with today’s GPUs as powerful as they are, that hit could be nearly meaningless. To help prove VXGI’s usefulness, NVIDIA went through the painstaking effort of recreating a famous photograph from the Apollo moon landing. With it, the company tries to prove the skeptics wrong by debunking a couple of arguments – mostly those due to lighting. In one particular argument, there’s a bright light seen as Buzz Aldrin descends out of the craft. Many people interpret this as being the sun, which complicates things because other photographs show the sun on the other side. 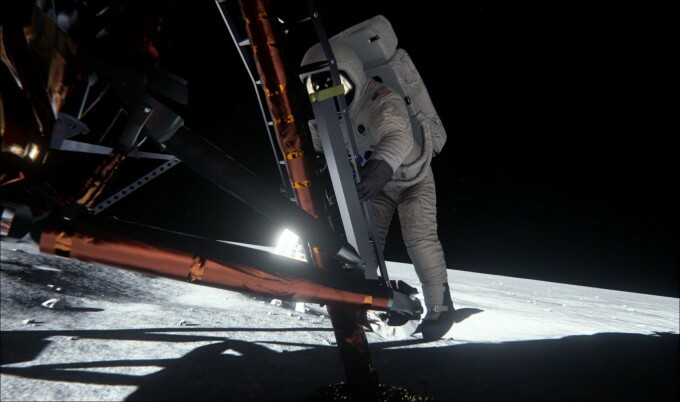 But with VXGI, NVIDIA was able to prove that this bright light was in fact Neil Armstrong – it just happened to be that his spacesuit reflected light extremely well. In order to create this demo, which will be released to the public in the near-future, all of the materials that appeared in these photos were accounted for, with their relative properties adjusted appropriately. 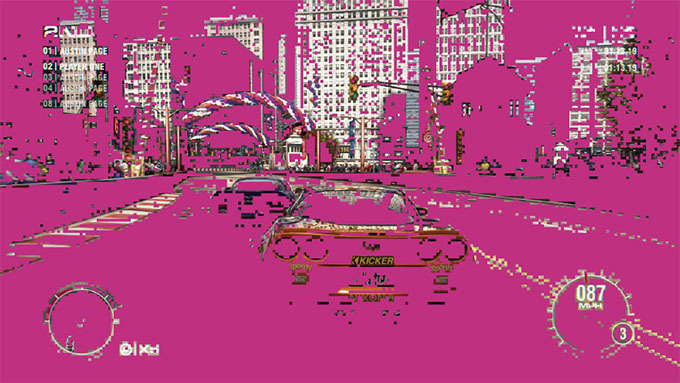 This demo will have a default mode that will match one of the famous photographs, but as you’d expect, you’ll be able to tweak numerous settings and generally have a lot of fun skewing such an important part of history. We see evidence with every high-end graphics card review we do that today’s options are ridiculously powerful. While the GTX 980 and even 970 are capable of driving resolutions higher than 1080p, there are still likely to be those who decide to stick with that resolution and simply crank detail levels to great heights. If you happen to fall into that camp, then DSR is for you. 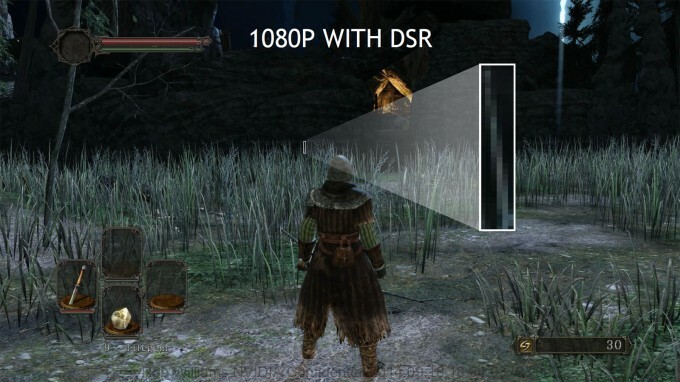 DSR in effect runs your game at a much higher resolution than your native, scaling it down in real-time. Similar to anti-aliasing, this is designed to smooth out the picture, but DSR’s goals go beyond that. Picture a scene from The Witcher 3: The Wild Hunt, or Dark Souls II, where you’re out in a field of grass. I am sure you’ve all seen the issue here: The grass in the background doesn’t have great detail, and often the tip of the strands will have gaps. DSR aims to fix that. Scaling-down a higher resolution isn’t enough to give us the effect NVIDIA wants, though; for that, a filter is applied that samples many more pixels than it’d be able to at lower resolution, and then applies a 13 tap Gaussian blur. The difference is very noticeable. DSR is yet another graphics option that NVIDIA’s adding to its GeForce Experience application, so if you’re running a modest GPU but can still run a game at 4K (or at least a higher resolution), GFE will tell you so. Those who like to do things the manual way are going to be able to do so as well. From within the NVIDIA Control Panel, you’ll be able to increase the resolution of your game from between 2x ~ 4x. 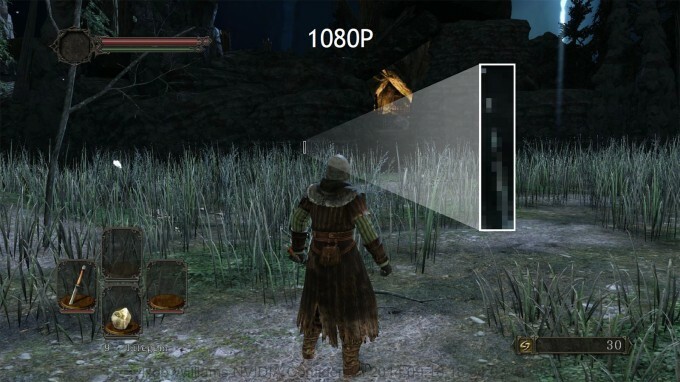 Even at 2x, you might still notice some good benefit, and it might be a nice option for 1440p gamers. MFAA stands for Multi-Frame Sampled Anti-aliasing (the “S” is apparently silent here). This is an anti-aliasing mode that aims to deliver the quality of 4xMSAA but with the performance hit of 2xMSAA. It works by sampling random points of each pixel, rather than the same points of each pixel, and the result looks very convincing. 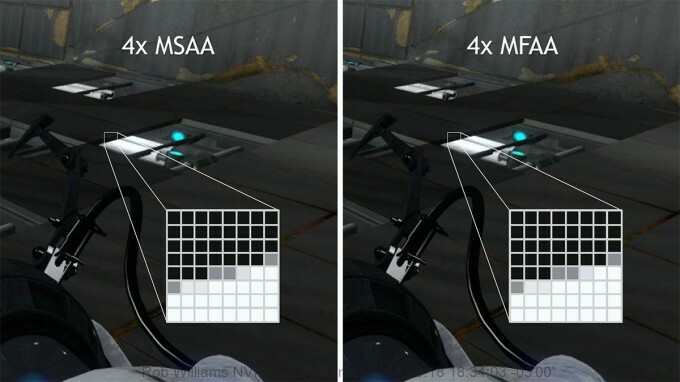 If you use anti-aliasing in games, MFAA is definitely a setting you’ll be wanting to try. 2xMSAA rarely induces that much of a performance hit, where as 4xMSAA does, so to have the latter quality-wise with the former performance-wise is extremely tempting. 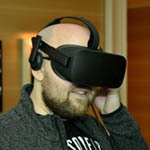 Virtual reality is something that NVIDIA takes pretty seriously, and so it’s developed a series of related technologies that fall under the “VR Direct” branding. These technologies include low latency, VR SLI, VR DSR, MFAA, auto asynchronous wrap, and auto stereo. One of the biggest issues surrounding VR at the moment is latency, and that’s one area that NVIDIA wanted to improve things in. With a couple of different technologies, especially asynchronous wrap, the company was able to halve the latency from 50ms to 25ms. Some of this required some aggressive optimization, but it got the job done. The company showed these improvements at its briefing last week, and every single person I talked to was effectively “wowed” by it. 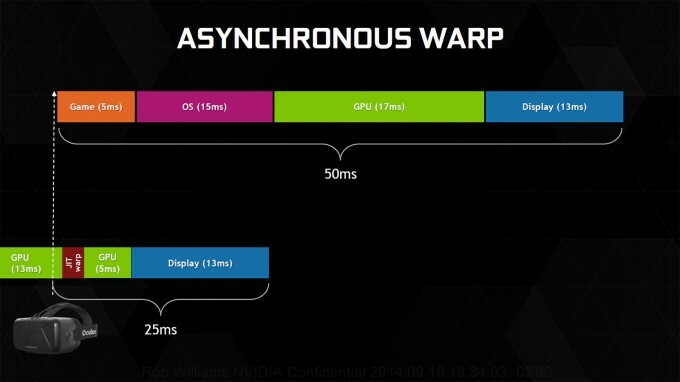 Along with all of these technologies, NVIDIA talked a lot about updates to its GameWorks game development library as well as which upcoming games are taking advantage of which features, but I’m going to wait until after the launch to talk about that. With all of this covered, it’s now time to peer into the performance results, but not without a look at our testing methodology first. For those who don’t care about that, you can jump right on over to page four.